Aw man, I need to go hug my cat. I remember trying to save a baby chick who had been abandoned by his mother in HI. I'm a city girl and I had no idea what to do, and no one around cared because wild chickens are a big problem on Kaua'i. I tried mixing chicken feed an water and dropping it in it's mouth. It died in my hand. So I know how you feel, Lee. It's such a unifying event, isn't it, trying to save an animal's life? We rescued two baby pigeons once that had fallen out of a nest. I hand fed them for days, but only one survived the next night. It's terrible to fail to save them, but what we did wasn't nothing- giving them a warm, safe place to pass away is better than nothing. My experience was with a kitten out of three. I've saved 6~ maya bird chicks. Were simpler. This is so sad... 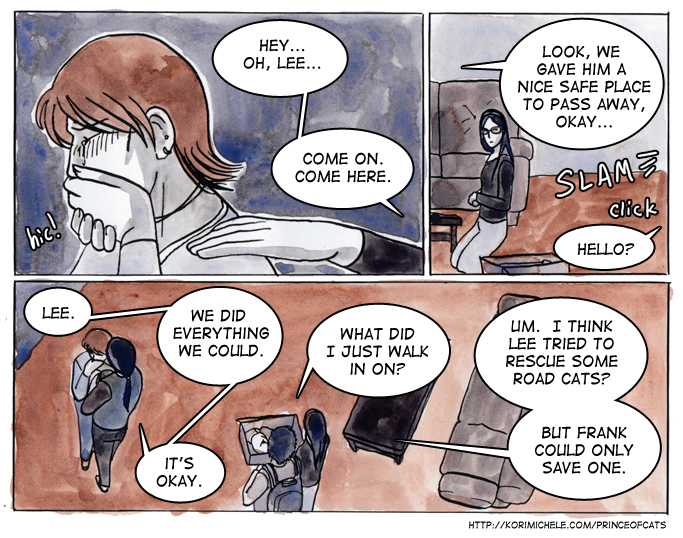 I totally understand how Lee feels. I once spent two days and a night trying to save a newborn kitten that had been abandoned by its mother, but it wouldn't eat, and eventually its mother came back and dragged it out my reach so she could be with it while it died... I felt so helpless and crushed. : \ I am loving that the main characters in this are so sensitive to animals.